Vietnamese enterprises have the potential to participate in regional and global production value chains on par with the leading countries in ASEAN, because Vi?t Nam has been a top priority choice of multinational corporations. The road from Dam Hong in Thanh Xuan District to Giap Bat in Hoang Mai District in the southwest of Hanoi was to have been completed in 2016, but was pushed back to 2019 due to a delay in acquiring lands. In 2018, Vietnam’s total rice exports reached 6.15 million tonnes, with export turnover of 3.15 billion USD. The industry saw a 5.7 percent increase in volume and a 19.6 percent increase in value compared to 2017. Vietnamese firms should focus on environmental protection and corporate social responsibility when investing abroad to develop sustainably and promote the socio-economic development of their host countries, experts have urged. Vietnam’s shrimp exports are expected to grow this year to a value of more than 4 billion USD thanks to free trade agreements, according to the Vietnam Association of Seafood Exporters and Producers (VASEP). The rankings will be used to alert the central bank to risks at financial institutions in the interest of safeguarding the banking system and protect depositors. The Vietnam National Coal-Mineral Industries Holding Corp., Ltd. (Vinacomin) loaded its first tonnes of coal onto the Viet Thuan Sky ship at Cam Pha port in the northern province of Quang Ninh on February 5 (the first day of the Lunar New Year). A Vietnamese blogger for Radio Free Asia has vanished after fleeing to Thailand, the news organization said on Tuesday, as rights activists voiced fear that he had been abducted. 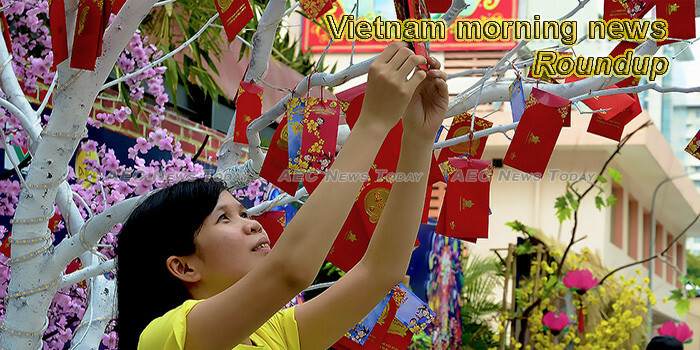 Travel agencies in Ho Chi Minh City have organised a great number of spring tours for tensof thousands of visitors on the occasion of the beginning of the Lunar New Year (Tet) 2019. Deputy Minister of Science and Technology Trần Văn Tùng talks to Tia Sáng (Ray of Light) Magazine about the support the Government has offered Vietnamese start-ups over the past four years. Party General Secretary and President Nguyen Phu Trong visited police officers, staff of the National Load Dispatch Centre (NLDC) and environmental workers of Hanoi who were on duty on the last night of the Year of the Dog on February 4. It’s often said Con market in the central city of Da Nang is a foodie heaven. If the football sector had an excellent year with titles of the runners-up in the AFC U-23 Championship and champion of champions of AFF Suzuki Cup 2018, Vietnamese beauties have also contributed to help the country to reach a higher position by their achievements in international beauty pageants. Authorities in the northern mountainous province of Dien Bien will implement a plan to promote the recognition of xoe Thai dance as a UNESCO intangible cultural heritage of humanity.